areas such as job creation, boosting the manufacturing industry and key infrastructure projects where the local stainless steel sector has an instrumental role to play. The South African stainless steel industry has long been a sector characterised by unrealised potential, not because of a lack of world-class production facilities in the form of the primary producer and a host of fabricators and finished product manufacturers who are more than capable of meeting world class standards but rather, global onslaughts from markets such as China and domestic challenges such as rising electricity costs and political uncertainty. There is also the challenge of a lack of support for local sourcing. For example, a well-known State Owned Enterprise (SOE) has recently sourced pressure vessels from Italy which could easily have been made here This is something the dti is working hard to combat through designation so if an SOE wants an exemption from buying locally the dti contact us first and asks if it can be made locally by one of our members. The China factor also had a key role to play in the recent imposition of a 25% tariff on South African stainless steel imports into the US market. 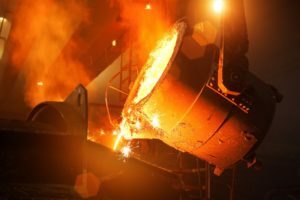 This stems from the huge increase in China’s production of stainless steel into the global market with, for example, the country increasing its production of stainless steel from 3.8% of global production in 2001 to a whopping 54.5 % in 2016, resulting in excess supply into the global market. This means that US stainless steel producers like most other markets have faced increasing competition from imported steel as other countries export more stainless steel to the US market to bolster their own economic objectives and offset the loss of markets to Chinese steel exports. Looking specifically at the US case an initial investigation conducted in 2001 and repeated in 2017, related to how steel (including stainless steel) imports are a threat to national security in terms of the US’s ability to manufacture key defence products internally as opposed to relying on foreign imports. This study stemmed from the need to increase the utilisation of US steel mills from 73% to 80% to make them sustainable and allow for the minimal 10% of their production that defence projects will require. The report outlined three options: Impose quotas on all imported steel at a specified percent of 2017 (by country and product) or put global tariffs at 24% (this figure was subsequently increased to 25%) on all imported steel or apply a 53% tariff on all imported steel products from 10 countries of which one is South Africa. These 10 countries account for less than 4% of US exports and have excess capacity and/or have seen large increases in imports from 2011 to 2017. For US steel imports, South Africa ranks 18th and has increased exports of steel to the US by 185% since 2011. As a result of this investigation, steel flat products, steel long products, steel pipe and tube products, steel semi-finished products, and stainless steel products in flat-rolled, long, pipe and tube, and semi-finished forms became subject to a 25% trade tariff on 1 May, 2018. From a Sassda perspective, the increasingly hostile global trade market highlights the need for increased local market demand which is something we are looking at strongly with ideas such as an in-depth study into existing market conditions and a gap analysis of the sectors which hold the most potential for development and growth. The African continent which is home to some of the highest growth rates in the world, also presents an exciting opportunity. We are therefore actively pursuing key country visits for the identification of potential manufacturing partnerships where our members can share expertise and secure lucrative supply contracts.